Widespread (EOO 35 870 km²) and not threatened. Mixed bushveld, thicket and nama karoo shrubland, on rocky ridges and flats. Some of the areas where this species occurs have been severely degraded by overgrazing, however plants have been found surviving in overgrazed areas and do not appear to be negatively affected by habitat degradation. A range-restricted, localized, but locally quite common species that does not appear to be threatened (S.M. Burrows pers. comm. 2011). 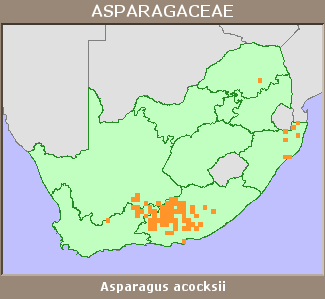 This species has been confused with Asparagus lynetteae, for example, plants from northern KwaZulu-Natal and Mpumalanga included in the distribution of this species in Obermeyer and Immelman (1992) are misidentifications of A. lynetteae (S.M. Burrows pers. comm. 2011).